Just over a decade ago I watched a ton of sales funnel videos and read a ton of articles on online marketing. I had a decent looking website, a ‘bribe’, and an email provider. I and was ready to launch my lead funnel machine! Typical for your first shot at something…I failed. Hardly anyone signed up. Even less read the special report, and EVEN LESS took any sort of action. Needless to say,…it was a bust. But…you move forward. You learn. You adjust. Now I can look at a funnel and see the errors a lot quicker. Sure that wasn’t always the case, but like everything, you get better with time. When someone comes to me with an offer that they say is not working, I can usually spot the glaring hole in a couple of minutes. Sure, it is easy for me now, but that is ONLY because I have made all those mistakes…and more. Now, I try to pass on what I have learned in articles, videos, and podcasts. Hopefully, people use the shortcut for something good. So…something isn’t working in your lead funnel getting machine? First. Let’s get on the same page for some terms. 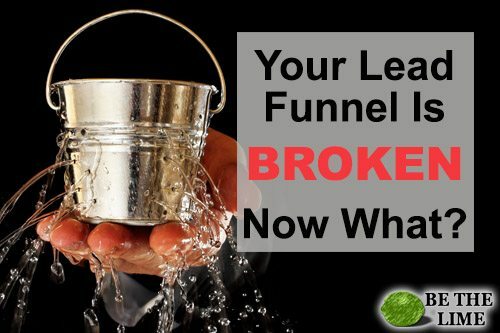 Lead “Funnel” – A funnel is the entire process of acquiring a lead and turning them into a buyer. It can start with someone responding to an ad and end with them buying something from you. It is also everything in between. You may take the user through one funnel and, when complete, add them to another. Website or Landing Page – This is the page where you take someone to first. Maybe it is your home page, but more likely, it is the page you want the viewer to “land on” first. Depending on where you are getting your traffic from, you might have several landing pages. Opt-In Form – This is where you are trying to get someone’s email so you can market to them in the future. Bribe – A bribe is the ‘what’ you are offering in exchange for the email. It could be something as weak as an email sign-up or something stronger, like a special report or video. Autoresponder – This is the series of emails they will receive after they have signed up for your email list. Sales Page – This is the page where you take someone to “show them” what you have for sale. It may or may not have a video. It may or may not be a long page. Order Form – Our favorite 🙂 – This is the page where the user gives you their credit card info. Those are some basic components` (we will add a few more later) but let’s get into it. If something is not working, new people are not arriving at the other end of our funnel, let’s look at WHERE we might have break. These rules, largely, apply to ANY business or product. Yes, there are certain exceptions, but I am not going to get into that here. Let’s walk before we run. To keep things consistent, I am going to say that THIS business is teaching people how to play the accordion*. *Didn’t see that coming, did you? Q: Fred, No one is signing up for my bribe. There are two things we need to satisfy at this stage right out of the gate. First, let’s assume you are getting traffic to your site. But WHO is that traffic and what are they doing? You can install Google Analytics on any website. It will give you ton of info including how long the user stays on your site, where they came from, and what pages they visit. If they are leaving your site right away, chances are, they never even saw your bribe. Does the overall design makes it difficult for them to find information or they should not have even been there in the first place*? *For example, we have a website dedicated to Factoring (as in investing money in receivables). There is also a mathematical term called Factoring. Maybe has something to do with fractions? I don’t know. I am a marketer, not a mathematician. So anyway…we get the wrong people there all the time and just need to take that into account. So…let’s assume the RIGHT PEOPLE are on the RIGHT SITE. When people land on our home page or your landing page, it is VERY obviously a site dedicated to accordions. You might think you can ‘leverage’ your efforts and add other musical instruments there, but the more you add, the less effective your site will be. Niche down. Stack on other offers later…but certainly not right out of the gate. Next, let’s look at your bribe. Is it appealing? Is it something people would want? Is it a free lesson on how to play the accordion? Does it have something worthy of me giving you an email? Do I WANT to opt-in? You will need to test different bribes. Clearly, I know nothing about the accordion, but I suspect a couple of those would at least get you some opt-ins. You can use tools like LeadPages to create several versions of your landing page or popup box. Once you get enough traffic, you can look at the best converters. Q: Fred, people are downloading, but nothing else happens. Where did they go? First off, the good news, they are now on your email list. Many people believe that you should immediately take them to your offer. In this case, maybe it is a whole video training on playing the accordion. The reasoning of presenting the offer right away is certainly valid. If they took your bribe, they want to learn. You may not know their ability level yet, but you are at least in the wheelhouse. So, AFTER they sign up, you take them to a special page. The mechanics are, technically, what we call the ‘Confirmation Page.’ – you have confirmed their email and take them to a new page right away. This can also be called a ‘Thank you” page. I would take them to a page that looks/sounds like that. Headline: Congrats! Your XXXX is on the way! Now, you can either write a ‘sales’ letter, but video is a great way to introduce your product. Tell them who you are and what they are going to get. In this case, it is probably not a very high-end cost. You don’t have a relationship with the person yet. Heck, they haven’t even seen your first video. Introduce yourself and take them on a journey. Something about how you struggled to learn the accordion and how you discovered a way to cut that learning curve in half. Your offer must be aligned with the bribe. For example, if the bribe was related to learning how to play a particular Pop song on the accordion, don’t make the offer related to playing classical music. If you gave them a pop song for the bribe, make the sale for them to get access to your training where you are going to teach them the 21 hottest pop songs. Alignment is key…and a lot of people miss this. Just because we see the connection in some cases, doesn’t mean the user does. You may ultimately be selling the same product on the backend, but the PITCH needs to be aligned with the bribe. Side Note: The same is true if you are paying for traffic. If your ad is related to Pop music, you want that conversation all the way through. The Ad, the Landing Page, the Bribe, the Offer. Now…let’s say not many people take the offer (purchase your offer). That is ok. We were just taking a shot at it. They might be the type of person we need to build a relationship with first. The autoresponder series is simply the next 3-5 emails they are going to receive from you. This is what I call the indoctrination period. The emails they get first should not be what you might send out every week or so to the group via a broadcast. You are going to want to control what they initially get from you. Think of it as a courtship. • Your first email might introduce who you are (Set the stage). • Your third email should share “epiphany” moment, where you found there was an easier way. • Your fourth email might be something about a “hidden benefit” of learning to play the accordion (Chicks dig it! I get more party bookings, etc.). • Your fifth email could have some urgency. (Why they should sign up for your training now). By controlling the first set of emails, we control how they feel about us, our product, etc. Not in a creepy way…just a chance to introduce yourself and explain why you made this course/product in the first place. *I also want to take this second to mention ‘open loops.’ As humans, we need resolution. We need to know the other half of the equation. Not only do I want people to read my email, but I also want them to read the next email. So often it is great to ‘open’ a loop that will be closed (answered) in the next email. It gives the reader something to look forward to tomorrow. I am going to handle both of these subjects as one since this article is already getting long. In a nutshell, they should look good. The sales page should have all the features and benefits associated with buying your course/product. A video is great (especially) in this example. People want to buy from a person whenever possible. If you don’t shoot video, you would at least want some pics of yourself on the Sales Page. Testimonials are also great. You may not have them in the beginning, but you will want to add as soon as possible. The check out Order Page should also be as easy-to-use as possible. I am not a big fan of paying through Pay Pal. It is not that I don’t like Pay Pal, and it can be used the background of a prettier looking page. It is just clunky when people checkout. Stripe, Shopify, and Clickfunnels all have great interfaces you can use that keeps them on your website. Any one of those items is a good place to start if your funnel is not performing the way you intended or hoped. Still can’t find the issue? If you go through this list and still can’t put your finger on the problem, check out my $99 Tune-Up Consultation. For only $99 I will look at your funnel and make some suggestions. Usually via email, but, time permitting, we can get on the phone and talk it out. These are VERY LIMITED since I don’t outsource this. Matter of fact, it is kind of stupid on my part since I charge more than $99/hr to work with people anyway. …But, I love prying into other people’s funnels and helping people out. So, if you made it this far in the article, I am willing to spend some time getting you on track.